SINGAPORE - Six foreign workers were injured, one of them severely, in a chain collision involving a lorry and two tipper trucks in Changi on Tuesday (Oct 31) afternoon. Photos of the accident circulated online show a man lying on the road behind a lorry, which is damaged in the back. There are blood stains on the road, as well as some traffic cones and other debris. Other photos show the damaged tipper trucks. The Straits Times understands that the lorry had slowed to turn when it was hit from behind by the first tipper truck. The second tipper truck then crashed into the first one. The police told ST that they were alerted to the accident involving the three vehicles along Tanah Merah Coast Road, towards Nicoll Drive, at 2.43pm on Tuesday. The Singapore Civil Defence Force dispatched three ambulances and took six people to Changi General Hospital. One had serious injuries to his neck and back. This is the latest in a series of reports about foreign workers getting injured in traffic accidents. On Monday morning, 26 foreign workers were taken to hospital after an accident between two lorries in Tuas. 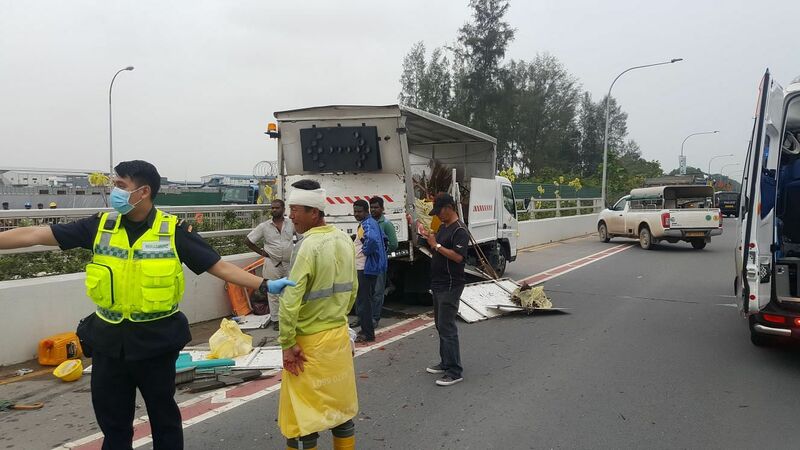 On Saturday morning, at least five foreign workers were injured after a lorry they were in skidded and fell on its side along the Pan-Island Expressway.